Halibut, an oceangoing flatfish averaging 30 to 40 pounds in size, yields white-fleshed fillets and steaks that are lean, meaty and firm. Halibut can be grilled, roasted, broiled or braised. Its mild, slightly sweet flavor pairs well with a wide variety of vegetable side dishes. In terms of putting together a meal, it's easiest to serve grilled vegetables next to grilled fish; saute vegetables in the same pan as your halibut fillet; or roast halibut alongside a selection of suitable vegetables. If you're ambitious, however, feel free to mix it up. 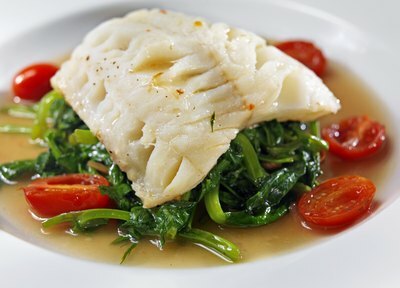 A thick fillet of halibut can be successfully roasted in the oven; it also responds well to being baked in parchment. Either way, roasted vegetables are the obvious accompaniment and can be cooked in the same pan or packet. 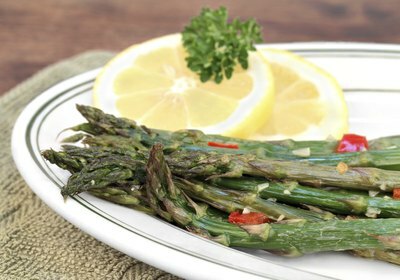 Try asparagus spears, baby artichokes, carrot coins, broccoli and cauliflower, green beans, tomatoes, corn or Brussels sprouts. You can also serve halibut alongside roasted beets, but in this case you should roast the beets in a separate pan lest the juices turn your halibut pink. If you're baking in a parchment packet, the cooking time will be the same for all ingredients; otherwise it's wise to start the vegetables before the fish to ensure both finish cooking at the same time. Sauteed vegetables go with almost any preparation of halibut; it's easy enough to roast or broil a fillet or steak while also preparing a quick sauteed side dish on the stove top, for example. Or you can cook the halibut and its accompaniments together in the same pan. 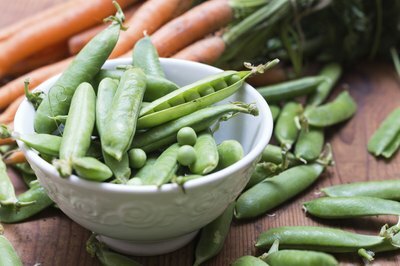 The sweetness of English peas and sugar snap peas plays well with the mild sweetness of halibut, as does a succotash saute of corn kernels and fresh shell beans, favas or limas. Try a saute of shredded leeks, carrots and summer squash tossed directly into the pan with your fillets. These small, tender vegetables will cook in the same time it takes for the fish to finish. If you are grilling halibut steaks, by all means grill your vegetables right alongside. For an elegant presentation you can assemble vegetable kabobs of summer squash chunks, cherry tomatoes and bell pepper sections. 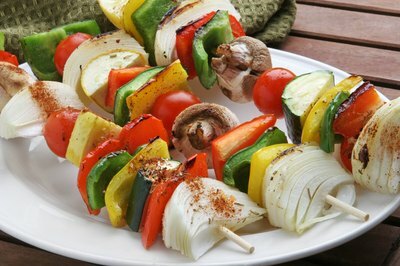 For a more casual take, use a grill basket with these same vegetables inside and serve them loose. Other vegetables that take well to grilling and complement halibut include corn on the cob, mushrooms and asparagus. Or try radicchio and endive on the grill; their mild bitterness provides a pleasing contrast to the creamy, mildly sweet character of halibut. Start the vegetables before you start the halibut, as the latter cooks through quickly on the grill. Your vegetable side dish made to accompany a halibut fillet needn't necessarily be cooked. A salad or slaw works just as well as a cooked side. Slaws in particular add a nice contrasting crunch to the creamy, yielding flesh of halibut. 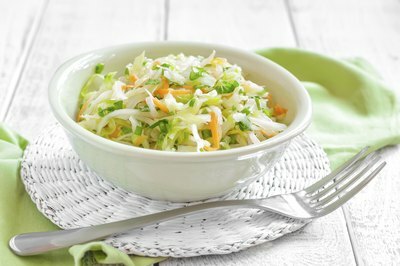 A simple red or green cabbage slaw dressed with either a mayonnaise-based dressing or a vinaigrette works well, as does a raw carrot- or fennel-based slaw; try broccoli stems and kohlrabi for an unusual twist. In the height of summer, a simple tomato salad provides a bright, acidic flavor contrast to mild and sweet grilled or roasted halibut. Don't neglect green salads either -- a mesclun or microgreen salad matches well with halibut, as does an arugula salad; in both cases the mild bitterness of the greens balances halibut's sweetness. For a more robust green salad, try a chopped salad full of crisp lettuce, cherry tomatoes, bell peppers, cucumber and any crunchy additions you like, such as sunflower seeds or walnuts.